This week over at Everybody Art Challenge we have an excellent sketch for you to follow. I have created a vintage card for a work colleague who will be leaving the team at the end of the month. 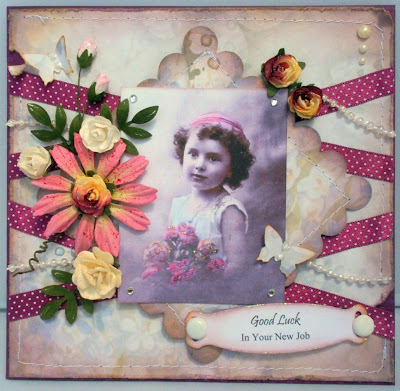 The image I found on the web - Maries Freebies. The paper has flowers and butterflies on it but it is so pale my camera didn't pick it up. I've embellished with flowers, ribbon and pearls. Thanks for looking and have a good week.